Vila Luna Nera is a sleek, modern, 78m2 3-bedroom villa on 2 floors, only 30 min away from the coastline and the bustling costal towns. You can enjoy the serenity and privacy of countryside living, yet be so very close to a variety of beaches, shops, restaurants and nightlife. 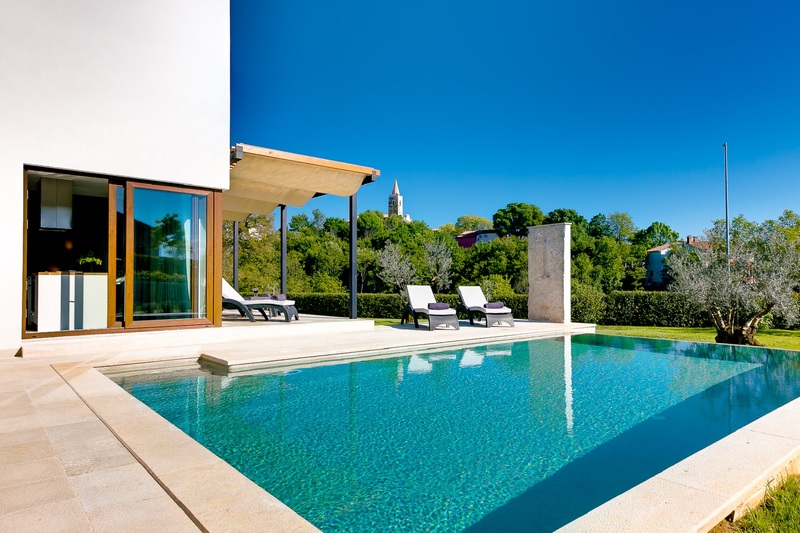 It is also an ideal location from which to explore Istria and all its magnificent beaches and quaint villages. Contemporary architecture is featured with sharp lines and minimal colors. The ground floor features a large open space with sitting lounge, dining area and modern fully equiped kitchen. The inside flows seamlessly to the outdoors through large glass doors that open onto the terrace, pool and verdant gardens. All 3 bedrooms are on the 1st floor. The Master has a double bed and private bathroom. The other 2 bedrooms share a common bathroom. The outdoors includes a BBQ and outdoor dining furniture.